Suspension Shocks & Struts @ Auto Motion Chatham Used Cars ON. Shocks and struts do more than cushion you on rough roads. They assist road control and ensure your safety. The Motorist Assurance Program (MAP)* now recommends that you consider replacing your shocks and struts at 50,000 miles. 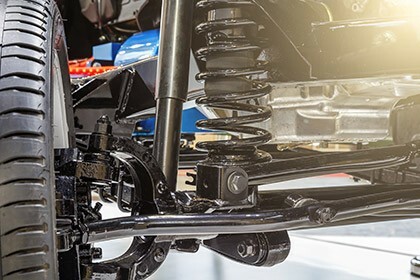 Signs of bad shocks or struts or worn springs include a bouncy or uncomfortable ride, bottoming out, the front end of the automobile diving or loss of control while making a sudden stop, the automobile swerving more than normal while changing lanes, and a automobile that sags in the front or the rear. Coil springs help shocks and struts keep automobile bounce to a minimum. All springs sag with age, as the spring weakens over time. Coil springs should be checked by a Auto Motion mechanic about once a year or so for your comfort and safety.